In 1705 Queen Anne granted a massive tract of rural land on Manhattan's west side to Trinity Church. Stretching approximately from Fulton Street to Christopher Street, it was originally called the Queen's Farm. Following the Revolution it was known as the Church Farm. One particularly ardent anti-Royalist during that conflict was Trinity vestryman William Laight. A prominent merchant, he was a member of the Committee of 100 which, among other activities, sent a list of "American wrongs" to London on May 5, 1775. When Trinity Church announced plans in 1803 for developing parts of the Church Farm slightly north of the expanding city, reaction was swift and negative. The boggy, reed-filled area was overrun with mosquitoes and snakes. It was known for decades as "where was skating in winter and hunting in summer." Undeterred, the Church forged on, creating Manhattan's most exclusive residential neighborhood, St. John's Park, by 1810. Trinity named one of the new roads Laight Street, in honor of William Laight. Laight Street was soon lined with handsome brick-faced homes. Christopher Lord, a manufacturer of medicine chests, lived at No. 54 Laight in the 1830s; and by 1846 the well-to-do George W. Prescott called it home. Prescott's private stable was just down the block at No. 48 Laight Street. But drastic change would come to the refined neighborhood two years after the Civil War. Trinity Church sold the St. John's Park property to the Hudson River Railroad Company, which immediately laid plans for a freight terminal. Wealthy homeowners abandoned their Federal-style mansions, which were quickly razed or converted for business. Henry J. Meyer's ship chandler business had boomed during the Civil War. He now used his fortune to get in on the rapid redevelopment of the freight terminal neighborhood. In 1870 he hired George W. DaCunha to design a warehouse building to replace the old houses at Nos. 54, 56 and 58 Laight Street. It would be just one of several such structures Meyer would erect in the immediate area. Interestingly, for this project DaCunha doubled as the builder as well. The completed five story structure was faced in red brick and took inspiration from the German form of Romanesque Revival known as Rundbogenstil. There was no attempt at costly, decorative materials for the utilitarian building. Instead, brick was used to create the handsome elements--elliptical arched drip moldings above the openings, a stepped corbel table below the cornice, and a blind roundel within the triangular pediment. The warehouse had barely commenced operation when it was the victim of what a headline in The New York Times proclaimed an "Extraordinary Burglary." Indeed, the heist committed on December 2, 1871 was the stuff of sensational crime novels. Towards the end of November a young woman rented a room on the top floor of the tenement building next door, at No 60 Laight Street. The newspaper explained that that building "adjoins and is fifteen feet higher than the bonded warehouse of Henry J. Meyer, Nos. 54, 56 and 58 Laight Street." A few days later, on Saturday, four men were seen bringing trunks to her room. But there was nothing out of the ordinary in that, nor in the fact that Monday morning "the room was vacated and the trunks carried away with a load of household furniture." But when the warehouse was opened that Monday morning, it was immediately apparent that burglars had ransacked the place. Investigation revealed that the criminals had entered by the roof scuttle, which had been forced open from inside the building. The Times reported that "made it clear that some of the outlaws had managed to secrete themselves in the [ware]house before it was closed on Saturday, and had thus passed out the plunder to their comrades, and had then got out in the same way." The crooks got off with $14,000 worth of goods--in the neighborhood of $280,000 today. Detectives were able to trace them to No. 211 West 13th Street and rushed in to make arrests. But, wrote The Times, "the hope raised by this discovery was instantly destroyed by the further information that the goods had been removed from this house on Tuesday." The trail then went cold. "It was found that they had been taken away in a two-horse furniture truck painted red, the driver of which was a short, stout German who spoke English very imperfectly, and who was assisted in the loading by two colored men. With this information the trace of the thieves was entirely lost." The break-in and loss was a rare incident for Henry J. Meyer. His business continued to flourish and he lived in style with his wife, Jennie, in Hastings-on-Hudson, New York. In 1877, the year that he died, he still operated several storage warehouses including the Laight Street building. Following Meyer's death, Nos. 54-58 Laight Street was taken over by Baker & Williams. Among the largest bonded storage firms in the city, it too operated from several locations. 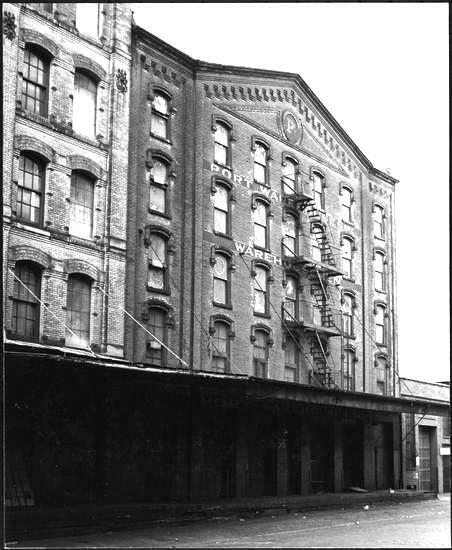 In the summer of 1897 George W. DaCunha's construction expertise was proved when a "fierce fire" broke out in the R. E. Dietz Company's factory next door. That building, which stretched to the corner of Greenwich Street, was nearly destroyed. Baker & Williams employees had jumped to action immediately when the fire was discovered. The Times reported that "the shutters of all the windows in the warehouse were closed, the doors locked, and every precaution taken against a deluge from the hose." When the blaze was extinguished, insurance inspector went through the warehouse, "but found everything intact. Not a drop of water had reached any of the valuable dry goods stored in the building." The Port Warehouse also operated multiple storage facilities. By 1925 it had acquired No. 54-58 Laight Street. 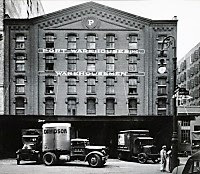 Unlike Henry Meyer and Baker & Williams, which handled mostly dry goods, Port Warehouse had a wide variety of clients. On September 28, 1925 one of Port Warehouse's drivers, Henry Harrison, left the building for Brooklyn's massive Bush Terminal. He was almost there when four men in an automobile forced his truck to the curb. Newspapers reported "Pressing pistols against his body, two of the four men drove Harrison to Ebbets Field, where he was thrown out. The other thieves made off with the truck before the police could be summoned." The kidnapping and robbery took place "in the view of hundreds of dock workers." Whether the crooks realized what they were stealing is unclear; but Harrison's truck was loaded with $30,000 worth of cigarettes. The valuable, if surprising, booty would be valued at more than $400,000 today. The Port Warehouse remained in the building at least through the 1970s. In 1990 a renovation resulted in offices above the first floor; and in 2009 it was renovated again for use as a "telephone exchange." The overhanging roof of the former freight platform was removed and the loading bays were filled in (rather unsympathetically). And a well-deserved cleaning unfortunately removed the old Port Warehouse signage. Otherwise, George W. DaCunha's nearly 150-year old warehouse retains its handsome dignity. Laight Street was certainly looking industrial and gritty in the 1970s and The Port Warehouse looked particularly shocking. Thank goodness the old warehouse has since been renovated back to its former glory. But one question remains in my non-New York mind. Why were ladders put on the front facade? If emergency fire escapes were needed, surely the back windows would have been safer. The size of the structure made fire escapes on both the front and rear elevations more sensible in order to quickly evacuate the hundreds of workers.